Having the right pair of women’s shoes is crucial. And when it comes to sandals, even more so. Sandals are a staple wardrobe item which are popular for taking on vacations, walking the dog, or even to wear during the warmer summer months when out and about in the town. With so many choices, styles and brands on the market, however, sometimes choosing the right pair of sandals can become quite a challenge. Perhaps you are shopping for comfort? Or want a really fashionable pair that will make you stand out? Or maybe you are shopping on a budget and don’t want to break the bank – we have you covered. In this article, we share 4 things you should look out for when it comes to purchasing sandals. As well, we have sourced 5 of the best women’s sandals currently on the market for you to take a look at. All with a range of different factors suited to your shopping preferences, in order to help you make a better purchase decision when you’re next looking to invest in a new pair of sandals. Generally, you will want to find a pair of sandals that look the part but also feel the part, and which are able to withstand walking on a lot of different terrains. When it comes to purchasing a good pair of sandals for women, there are a few factors you should consider before you make your decision. This one speaks for itself, you’ll want to make sure your sandals are perfectly comfortable as they may look really nice on, but after walking for a long period you don’t want to discover they only look nice and don’t actually work for your feet. When purchasing sandals, make sure to consider the materials used to make them. Different materials provide different levels of comfort and reactions to your feet. Leather can sweat, whereas rubber can often be difficult to walk on. Always consider what your shoes are made of, where they come from and how they will work for you. Having waterproof sandals may also be an important factor to consider, especially if you are always wearing them, there is certainly a chance they will get wet and you wouldn’t want them to get ruined at the first instance of water getting on them. Finally, their durability is also an important factor to consider as you’ll want to invest in a pair of shoes that will last. Make sure that they’re not made too cheaply to ensure they’ll last a couple 0f years. Next, we will take a look at 5 different pairs of sandals that are currently popular on the market. Hopefully, this will give you a better idea of what to look for when you go shoe shopping! If you are looking for an inexpensive pair of stylish sandals, then Rekayla has you covered. 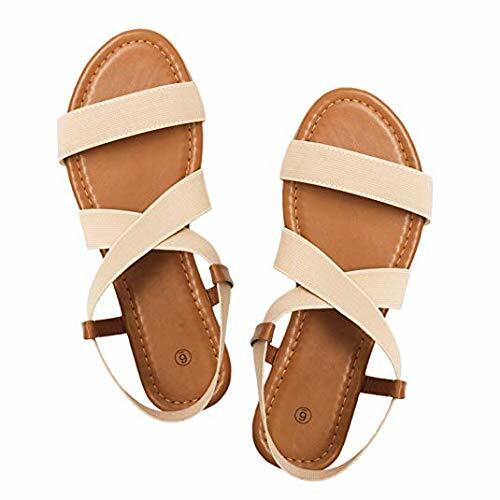 These elastic sandals are the perfect mix of comfort and style, and will definitely be a good choice for those on a budget. Below we take a look at the Rekayla flats in a little more detail. The Rekayla Flat elastic sandals are an easy-to-wear pair of flats, which are both fashionable and comfy at the same time. These sandals will turn heads, and even more so when your friends realize how inexpensive they really are. They come in a range of different colors and are extremely popular for the summer season. These shoes are the perfect little pair which you will wear time and time again. This is because they are both stylish and comfortable, featuring stretchy straps to better fit your foot size. With a light non-slip rubber sole as well as light padding, they are perfect for walking and keeping your feet feeling comfortable. Sometimes shoes can rub your feet after wearing them for too long. With the Rekayla flats you don’t need to worry; the thick elastic straps on this shoe make them super comfortable to wear all day long without having any issues. The Plaka sandals are simply perfect for those looking for something a little prettier. These sandals are sure to match with any outfit, and designed to last a long time. Below we take a look at the Plaka flats in a little more detail. These Plaka sandals are the perfect vacation shoe. With their unique hand-woven rope design, they are great for walking and bound to get you some compliments along the way. These beautiful sandals have been handmade with care using high-quality rope and using only the best materials to provide a comfortable experience for your feet. They come with all-natural packing materials, including a reusable 100% cotton bag. The Plaka sandals were originally designed in Crete, an island in Greece, and these ones were then re-designed and sold in a variety of different colors. The true Grecian style, however, remains, and many people will notice how nice your shoes are when you wear these. The rubber soles of the Plaka sandals are made with a strong and robust rubber, while the rope stretches to fit the individual’s foot. This allows your feet to relax without too much constraint and allows for more foot freedom. If you are looking for a sandal which can be used on rougher terrains, Teva provides a very good product, and with their athletic sandals, you can go far. Below we look at some of the sandal ’s key features. 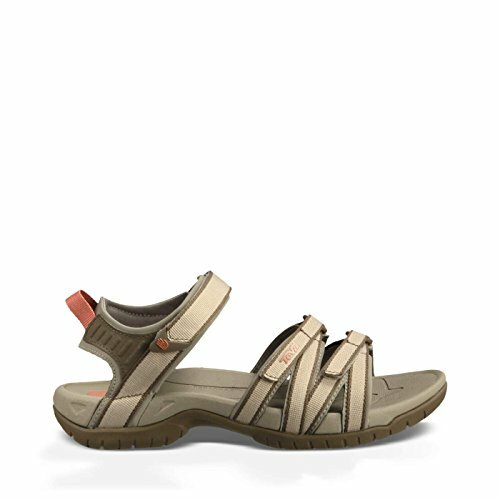 If you like being active and desire a sandal which can go along with your active lifestyle, then you will love Teva’s Tirra Athletic Sandal. These shoes are perfect for getting out into the open while still keeping that feminine flair. With an easy hook-and-loop Velcro strap which can be adjusted to fit, as well as a cushioned shock pad in the heel, you can be guaranteed a really comfortable shoe. A compression molded EVA midsole is also included in the sandals to allow for an even cozier fit throughout the foot. Featuring an extremely durable rubber outsole, these smart shoes can be used for hiking, climbing and even water sports due to their extra powerful grip which helps to keep a solid footing. They’re also treated with an antimicrobial solution which prevents odors from sweat and heat. The Birkenstock EVA sandals are the fourth pair featured on our list and are a good option if you are looking for a waterproof sandal. Let’s take a look at more of their key features below. Comfort is key when it comes to any sandal, and the Birkenstock definitely wins in levels of comfort. This is due to its overall design, which features a rubber so lightweight it will feel like you are walking on air. With so much walking your sandals are bound to become a little dirty over time. With these shoes, however, you can easily toss them in the wash and have them look brand new again thanks to their special composition. Most sandals cannot be washed as easily so the benefit of having a pair of these is that you can make them last a lot longer. The Birkenstocks are designed to be anatomically shaped. This means they have an easier fit to your foot and actually mold to your shape the more you wear and walk in them. This leads to a very comfortable shoe that you will most likely want to wear 24/7. The best thing about these sandals is the large selection of different colors available. You can choose from almost every color ranging from black to blue, grey, purple, pink and a whole lot more. Strangely some customers complained that these shoes are difficult to keep on, and when walking can sometimes fall off. Crocs are recognized worldwide as being the most comfortable shoes to wear thanks to their unique lightweight design. Made with a synthetic breathable material they are the perfect pair of shoes for any activity, whether chilling around the house to shopping in the city. Thanks to the materials used in Crocs, they are able to be used in water without any issues and are completely waterproof. The Croslite foam construction design makes the water run straight off without absorbing or ruining the shoe at all, meaning with a pair of these you can safely walk through water and participate in a range of water sports comfortably. They are also odor-resistant, meaning nothing will make them smell – even after continued use. They are also pretty easy to clean and dry fast. The best feature of the Swiftwater Crocs is their level of comfort. Featuring three choices of shoe size, you can choose from: roomy, which provides the most generous fit; relaxed, which has a little room and feels more secure on the foot; and finally standard which gives a comfortable fit with no extra room. All of these sizes can be selected based on what the individual prefers, giving you a good selection of fits to choose from. 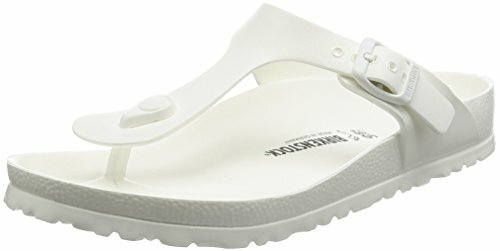 Which Are The Best Sandals For Me? Choosing the right sandal for you largely depends on your personal taste, where you will be wearing the chosen sandals and how much you’re looking to spend. If you are shopping on a budget and therefore looking to purchase the cheaper option, then the best brand to go for is Rekayla. Their flat elastic sandals are the most inexpensive option on our list, and still durable to last a good amount of time. Perhaps you are looking for a sturdy, and strong sandal? Then we recommend the Women’s Tirra Athletic sandal by Teva as this is specially designed for more rough terrain as well as sports use. If it’s comfort you are after, then Croc’s Swiftwater women’s sandals are by far the comfiest option on our list, as they feature a synthetic sole with breathable upper mesh. Finally, if you prefer style over comfort, yet still want a bit of comfort, the Plaka sandals are a perfect choice as they are both stylish and comfortable. So there you have it, 5 unique sandal options that you can consider on your next shoe shopping quest.